TN Catering is one of Jersey’s leading event catering companies. With vast experience we provide quality catering to our clients. We tailor our food to each individual client, allowing us cater to your exact requirements. We are passionate about the delivery of high quality food and service. We are proud to use local Jersey produce in our menus. We cover all aspects of catering in Jersey including: Weddings, Corporate Events, Buffets and Private Parties to name a few! Thank you so much to you and the team for making our wedding day so wonderful! I just want to say a big thank you, we had so many comments that it was the best catered event that they’ve ever been to. Especially noted was the lamb and samosas. 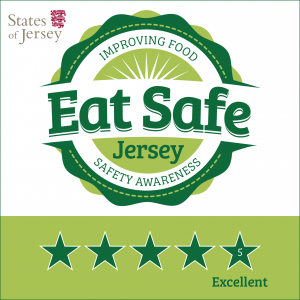 We are also delighted to have been awarded 5 Stars by the States of Jersey Environmental Health.